Texas A&M University researchers have developed a new flame-retardant coating using renewable, nontoxic materials. 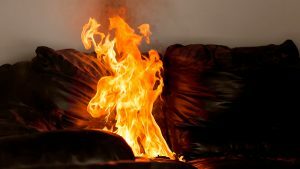 According to Dr. Jaime Grunlan and his team, the new flame-retardant provides better fire protection to materials including upholstered furniture, textiles and insulation. “These coatings offer the opportunity to reduce the flammability of the polyurethane foam used in a variety of furniture throughout most people’s homes,” notes Grunlan. The project is a result of an ongoing collaboration between Grunlan and a group of researchers at KTH Royal Institute of Technology in Stockholm, led by Lars Wagberg. Wagberg’s group specializes in utilizing nanocellulose, and they have in turn provided Grunlan with the ingredients he needed to complement his water-based coating procedure. According to Grunlan, the uniqueness of his team’s study lies in the use of two naturally occurring nanomaterials, clay nanoplatelets and cellulose nanofibrils.. Among the numerous benefits gained from using this method, one could possibly be the coating’s ability to create an excellent oxygen barrier to plastic films that are commonly used for food packaging. They could also pave the way for better fire protection at a lower cost than other, more toxic ingredients traditionally used flame-retardant treatments. To test the coatings, Grunlan and his colleagues applied the flexible polyurethane foam – often used in furniture cushions – and exposed it to fire using a butane torch to determine the level of protection the compounds provided. While uncoated polyurethane foam immediately melted when exposed to flame, the foam treated with the researchers’ coating prevented the fire from damaging any further than surface level, leaving the foam underneath undamaged. “The nanobrick wall structure of the coating reduces the temperature experienced by the underlying foam, which delays combustion,” Grunlan said.